If you choose to customise your headers and footers you will be presented with the editor window. During the below process you will learn the different functions of this editor. To open the editor make sure you select Custom Header in either header or footer settings. Then select Edit. Construct your header or footer using the editor display below. Pointer. The selection tool; use it to select elements within the editor in order to move them around or resize them. Line, Square, Rounded square & Oval. These are drawing tools for drawing shapes of their respective types. T. The text tool, allowing you to draw a text area within which you can enter custom text, or database references (see Insert Fields, below). Filmstrip. The picture tool, allowing you to draw an area where you can insert an image - such as your company logo, or a background image. Once you have drawn a placeholder for your image, right-click it and select Import to replace the default (coffee cup) image with your own. Layering. Provides standard layering tools. Align. Provides standard object alignment tools. Cogs. Provides various options, including the ability to Import a previously created design (via the Open... option), save your current design (via the Save as... option), open the SVG attributes panel, as well as a number of selection, layering & alignment tools. Show grid. Hides / shows the background grid. 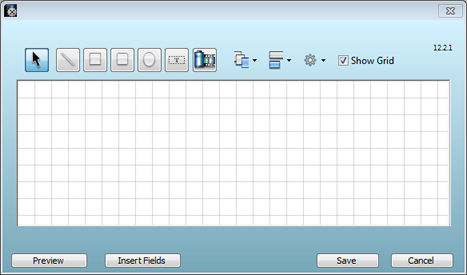 This grid will not print (even if shown in the editor); it is merely to assist you with aligning elements. Preview. Lets you preview your design with all references displaying rendered data. In other words, if you have a database reference that displays your company name, clicking Preview (and Close Preview) will toggle between displaying the reference, vs. displaying the actual data that is being referenced. Select Save to close the editor and OK the save your changes.